C1392. PIERRE MONTEUX Cond. San Francisco S.O. 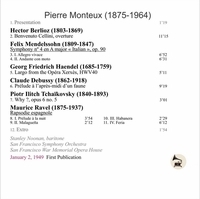 : Berlioz, Mendelssohn, Debussy & Ravel; w.Stanley Noonan (Bar. ): XERXES - Ombra mai fu (Handel); Why? (Tschaikowsky). (Canada) St Laurent Studio YSL 33-316, Live Performance, 2 Jan., 1949, The Standard Hour, War Memorial Opera House, with announcements. Transfers by Yves St Laurent. “One of the titans of 20th century music, PIerre Monteux was a much-loved conductor whose career went from Paris to Boston to San Francisco to London, and whose influence continues today through the many musicians who studied conducting with him in his retirement in Maine. 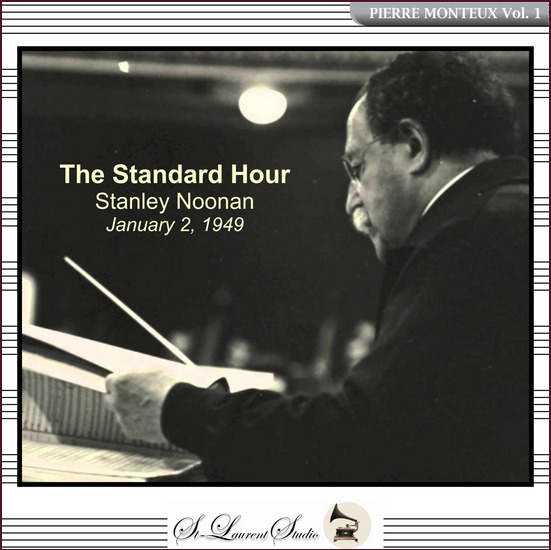 Pierre Monteux had one of the longest musical careers in memory, exceeded perhaps only by Pablo Casals and Leopold Stokowski. He retained a youthful appearance (and a full head of black hair!) well into old age, and he was well loved by colleagues and audiences alike. He started violin studies at the age of six and then entered the Paris Conservatoire at the age of 9. He made his conducting début in Paris at the age of 12. He was a co-winner of the first prize for violin in 1896, with the great violinist Jacques Thibaud. He served as principal violist in the Opéra-Comique and was also assistant conductor and concertmaster of the Concerts Colonne. In 1894 he joined the Quatuor Geloso as a violist and was privileged to participate in the performance of a Brahms quartet in the composer's presence. In 1908 he became conductor of the Orchestre du Casino in Dieppe and in 1911 founded a series called the Concerts Berlioz. In the same year, he began a historic association when he was hired by Diaghilev to conduct his Ballets Russes. He led the premieres of Ravel's DAPHNIS ET CHLOÉ, Debussy's JEUX, and Stravinsky's PETRUSHKA and RITE OF SPRING, the last of which caused a notorious audience riot. In 1914, when war broke out, he was called to military service. He received a discharge in 1916 and travelled to the United States, where he obtained a conducting post at the Metropolitan Opera that lasted until 1919. At that point he was engaged to conduct the Boston Symphony Orchestra. Taking up the post in 1920, he walked into a labor dispute, with his musicians on strike; by the time the strike was settled, the concertmaster and 30 other musicians had left. 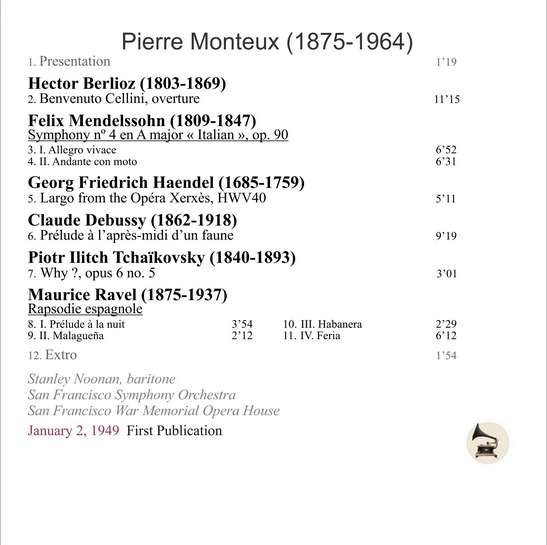 Monteux had to rebuild the orchestra - a difficult task, but an opportunity for Monteux to mold the orchestra according to his own taste; ever since then, the Boston Symphony Orchestra has been known for its French sound and its expertise in French and Russian repertoire. He remained in Boston through 1924, gaining a reputation as a supporter of modern music. He brought to America not only Stravinsky and the French composers, but such others as Respighi, Vaughan Williams, and Honegger. In 1924 he began a ten year association with the Amsterdam Concertgebouw. He was a good fit with the orchestra's other conductor, Willem Mengelberg, who had a Romantic-era style, and who specialized in traditional repertoire and Dutch composers. In addition, Monteux founded the Orchestre Symphonique de Paris in 1929, and the École Monteux, a coaching school for young conductors in 1932. In 1936 he returned to the United States as conductor of the San Francisco Symphony Orchestra, staying in that position through the 1952 season. During World War II he obtained American citizenship and transferred his École Monteux to his new hometown of Hancock, Maine, where Erich Kunzel, Neville Marriner, and André Previn were among his students. He guest conducted and recorded extensively, and in 1961, at the age of eighty-six, accepted the musical directorship of the London Symphony Orchestra. RCA Victor recorded him extensively in stereo, not only in Debussy, Ravel, Milhaud, Stravinsky, and the like, but also in Beethoven and Brahms; Monteux was especially noted for his performances of these composers' music, to which he brought an unusual charm and lyrical quality. He strove for transparency of sound, precision, light and springy rhythms, and that elegance that seems particularly associated with French music."